I’ve been reminded just how much D needs her routine today – hence the late blog. I had it all worked out, today is something to do with being left-handed and that was going to be my blog tonight. But we went along to training, to watch T being given a trophy and a medal – which was lovely. Initially D was comfortable, she had her chair in her little pop-up shelter, her sanctuary. 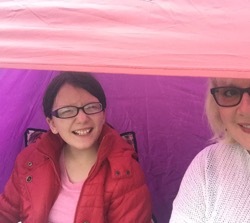 She was happy, enclosed, away from the sights and sounds of boys training, she was okay with me chatting to another parent close by, because she was enclosed. And then it was time to pack up. D had to come out of her sanctuary and she didn’t know what to do. It was also twilight and she doesn’t like being out in twilight, it makes her think it’s midnight and that she isn’t getting to go to bed – that evening routine is extremely important. T, bless him, tired after training, just wanted to get home and unfortunately for him, what should be a five minute walk and then five minute drive (oh yes, he knows the timings) turned into over half an hour, he wasn’t impressed. So, it’s all been a bit late. Assurances made to D that we went to training tonight only because there was a presentation, that we wouldn’t go again until the evenings wouldn’t be drawing in at the time, that we wouldn’t (hopefully) be late. A reminder that, for me, I can plan and plan, but those anxieties can take over at any time for D. But it’s a case of “expect the unexpected” but don’t mess with that routine, isn’t it?